"Do not adjust your set. 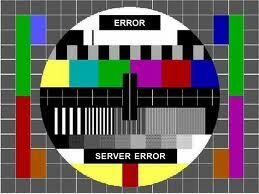 The problem is with our transmitter." At approximately 10:00 pm Central Time Saturday night our website, usually found at www.hyperbariclink.com, went off-line due to a technical problem encountered during a routine equipment upgrade. Our hosting provider, one of the largest in the US, tells us the issue is effecting dozens of websites and they've been working through the night to resolve the problem. Great. Expect to see the site back up sometime this afternoon. We'll keep you posted. Update, Sunday, 6:12 pm - The hosting provider says they're still struggling with it. For the technically inclined, the issue is apparently a significant problem with the storage array connected to the grid the provides CPU's for websites in our cluster. Update, Sunday, 9:40 pm - And...we're back. An outage of nearly 24 hours isn't our favorite spare time activity, but this is the reason big hardware upgrades are done on the weekend. We resume our regular programming on Monday.